Amalgam-Free Dental Service in Milton | Book a Free Consultation now! Are you looking for a dentist in Milton? Our patients who desire amalgam-free dental fillings will be obliged to know that Sapphire Dental, your emergency dentists in Milton, works with a variety of curative materials, some of which are free of mercury or amalgam. 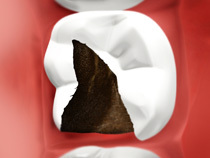 Whether you need your filling replaced or want to consider crowning to cover the discolored or damaged teeth, we are more than happy to help you. If more complex procedures like tooth- replacement, tooth-implants or root canal therapy are needed, then our Milton Dentists can work with you. We will formulate a treatment plan aimed at restoring or replacing your natural teeth without the use of amalgams, offering you the healthy and beautiful smile you deserve. Book an appointment with our dentists in Milton today!